Want to increase employee engagement? We’ve got an app for that! Edit (2/1/18): After months of user feedback, we released a new version of the employee time tracker app, which comes fully equipped with a new design, new features and faster load times. That’s how many US businesses said they plan to improve employee engagement in 2017. The year is coming to an end, but there’s still time to make good on that commitment. Increasing engagement at work doesn’t have to involve complicated, new processes or ineffective team building activities -- all it takes is an app. 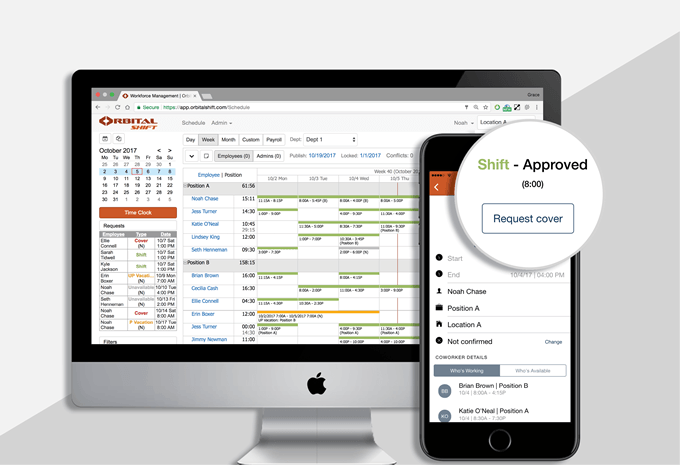 For the past eight years, we’ve worked hard to unite the powers of online shift scheduling, employee communication and a mobile time clock under one powerful platform. 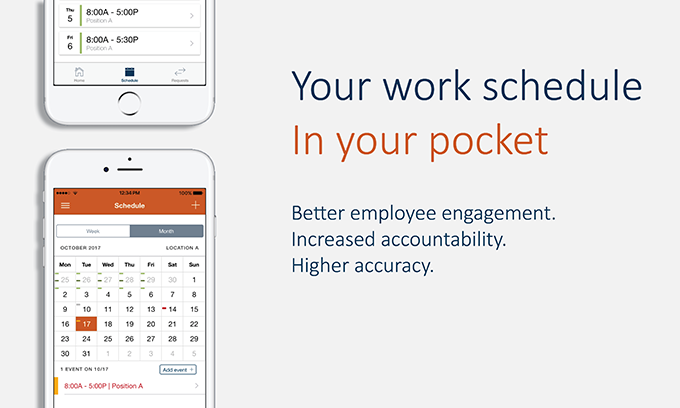 And now, with our new employee scheduling app, your staff will have access to all of their work-related information right at their fingertips. 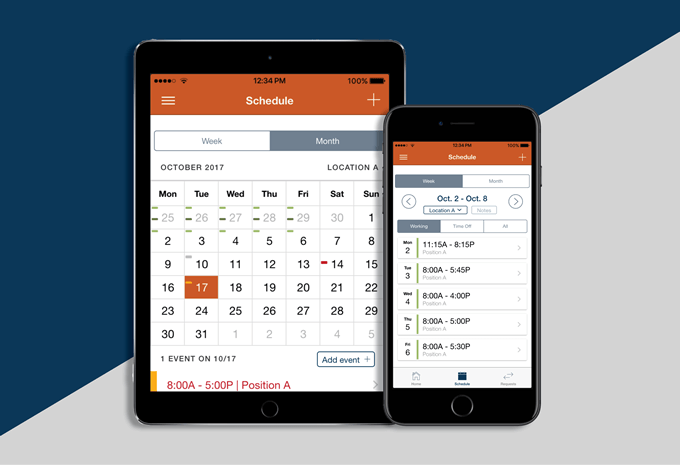 Orbital Shift mobile apps give employees the power to not only access their work schedule and notes, but also to manage time off and shift requests - all from one easy-to-use, mobile dashboard. Managers will never have to deal with another lost sticky note or missed voicemail again. Time and work management is easy when employees have full visibility into their work schedules. Employees can view their work calendar by week or month from the Schedule page. Color-coded labels make it easy for employees to view their upcoming shifts and time off. The Orbital Shift employee scheduling app gives staff the power to manage their time off and vacation requests from one convenient, mobile spot - which, in turn, gives managers more time to focus on the bigger picture. Employees can submit time off, vacation or absence requests right from their phones in seconds. They also have the option to leave notes with their requests so both staff and management are always on the same page. Employees can also view their coworkers’ requests, which gives them a better idea of when they can request time off. Get rid of outdated punch cards and timesheet machines, and put the power of a online time clock in your employees’ hands. With the Orbital Shift mobile apps, staff can clock in and out in seconds, right from their phones. 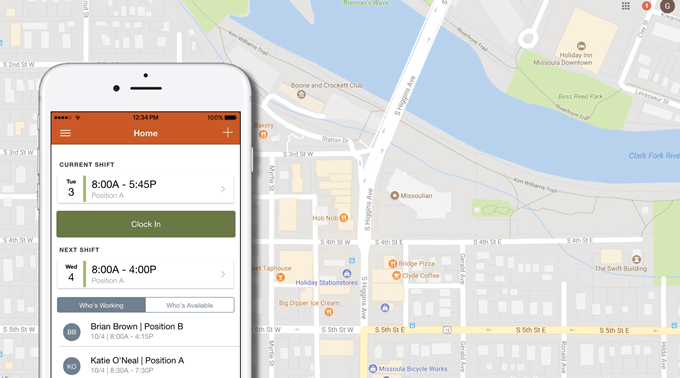 GPS geofencing allows managers to restrict clock-in locations, ensuring employees are on location when they’re on the clock. Your workforce is the one aspect of your business that’s under your control. And improving employee engagement could result in 21% higher profitability. So what are you waiting for? Now is the time to be proactive. Now is the time to put the power of scheduling, communication and a mobile time clock in your employees’ hands.